Please join the National Cambodian Heritage Museum & Killing Fields Memorial as we commemorate more than two millinon people who lost their lives during the Khmer Rouge regime and celebrate the resilience of the Cambodian community through a play, Camboidan Rock Band, by Lauren Lee with music by Denge Fever. We are honored to partner with the Victory Garndens Theater on its production of Cambodian Rock Band. "Part comedy, part mystery, part rock concert, this thrilling story toggles back and forth in time, as father and daughter face the music of the past. Neary, a young Cambodian American, has found evidence that could finally put away individuals who carried out the Cambodian genocide. But her work is far from done. When Dad shows up unannounced—his first return to Cambodia since fleeing 30 years ago—it’s clear this isn’t just a pleasure trip. A wild rock-and-roll journey through the eyes of father and daughter." Storytelling Basics Workshop by Ada Cheng, Ph.D. In this storytelling basics workshop, we will discuss basic tenets of this art form, such as descriptions, basic story arc, emotions, relationships with the audience, and purpose of storytelling. Students will have the opportunity to integrate these elements of storytelling and practice telling during the session. Ada Cheng is a professor-turned storyteller and performing artist. She has been featured at storytelling shows in Chicago, Atlanta, Cedar Rapids, New York, Asheville, and Kansas City. She debuted her first solo show, Not Quite: Asian American by Law, Asian Woman by Desire, and performed it at the National Storytelling Conference, Capital Fringe Festival, Minnesota Fringe Festival, and Boulder Fringe Festival in 2017. She debuted her second solo show, Breaking Rules, Broken Hearts: Loving across Borders, with Fillet of Solo and performed it at both The Exit Theatre in San Francisco and the United Solo Theatre Festival in New York in 2018. She will be taking this solo performance to Los Angeles Women’s Theatre Festival in March this year. Ada is a speaker for Illinois Humanities 2019-2020 Road Scholars Speakers Bureau. She is also a teaching artist for Changing Worlds and an adjunct faculty member at Dominican University. She is the producer and the host of several storytelling shows, including Pour One Out: A Monthly Storytelling Series, Am I Man Enough?, and Talk Stories: Asian American/Asian Diaspora Storytelling Show. Her motto: Make your life the best story you tell. 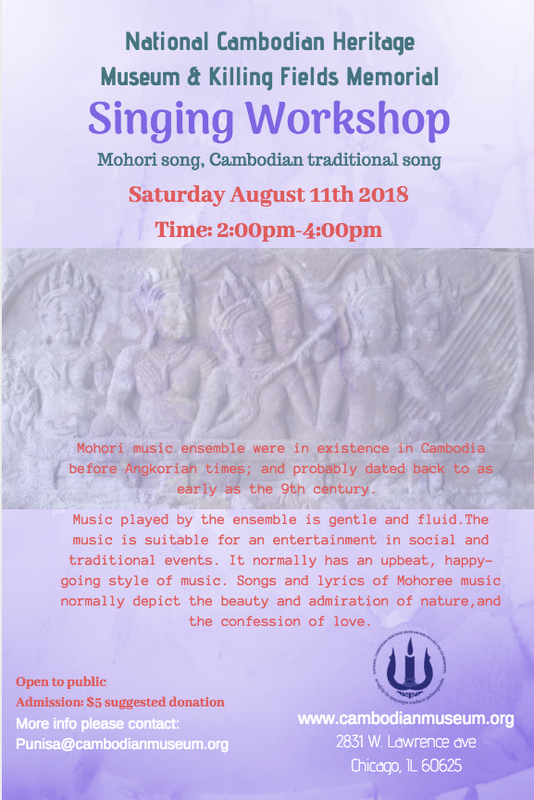 Please join The National Cambodian Heritage Museum & Memorial for an evening of celebration as we gather to mingle and support cultural and artistic preservation. Ada Cheng's latest show tackles issues about gender, culture, and feminism. Ada Cheng explores how one learns about womanhood, love, and abuse in different sociopolitical and cultural contexts through personal stories. An intense personal journey, this solo weaves tales of breaking rules and broken hearts across borders. This performance is relevant to current debates about gender equality and women's status in American society. Ada Cheng is a professor-turned storyteller and performing artist. She is the Bughouse Square Debates 2017 winner. She has been featured at storytelling shows in Chicago, Atlanta, Cedar Rapids, New York, Asheville, and Kansas City. She debuted her first solo show, Not Quite: Asian American by Law, Asian Woman by Desire, at Chicago SOLO Festival in January 2017. During the summer of 2017, she toured across the US at various storytelling festivals and shows. She also performed excerpts of her solo for Ripped: A Living Newspaper Festival (produced by American Blues Theater) last May as well as for PEACEBOOK (produced by Collaboraction Theatre) at the Goodman Theatre last September. Her solo has received great reviews from both Washington Post and DC Metro Theater Arts. and will take it across borders to the Toronto Fringe Festival in July 2018. She is the host of Pour One Out, a monthly storytelling series at the Volumes Bookcafe. She is also the producer and the host of the new show, Am I Man Enough: A Storytelling/Podcasting Show. Her motto: Make your life the best story you tell. Randy Kim will serve as the opener for Ada Cheng's performance. He is a queer Southeast Asian storyteller from the Chicagoland area. He comes from a family whose father survived the Cambodian genocide and mother who survived with her family after the Vietnam War. He has performed at other storytelling shows such as You're Being Ridiculous, Is That A Thing?, TenX9 Chicago, Pour One Out, and PREACH. Randy currently serves as a board member with the National Cambodian Heritaged Museum & Killing Fields Memorial. The National Cambodian Heritage Museum & Killing Fields Memorial (NCHM) is a 501c3 non-profit museum that is dedicated to the history of the Cambodian Killing Fields genocide (1975-79) in which an estimated 2 milllion Cambodian were killed. The museum opened in 2004 as the only museum outside of Cambodia dedicated to the history of the genocide. The museum has provided healing and cultural preservation to many of the survivors and their children through art, music, and dance. Portions of the proceeds from this event will go towards the museum to support their work for the community and focus on genocide awareness. Chicago, IL - September 28th - The National Cambodian Heritage Museum & Killing Fields Memorial (NCHM) and the Cambodian Association of Illinois (CAI) are proud to host its free film screening of the movie, First They Killed My Father, directed by Oscar-winning actress Angelina Jolie at the museum on Sunday, October 15th at 4 pm. The Netflix movie is based off of Loung Ung’s best-selling book about the author’s experience as a child survivor of the Cambodian Killing Fields that occurred from 1975 to 1979 which resulted in the murder of over 2 million Cambodians. This free film screening will also feature a post-film panel discussion with members from the Cambodian community in Chicago that will share their experience in the aftermath of the Khmer Rouge Killing Fields. The film screening is open to the public, and will be at the museum located on 2831 W. Lawrence Ave, Chicago, IL 60625. Please visitwww.cambodianmuseum.org, or www.facebook.com/cambodianmuseum for more information.